An environmental design researcher at Texas Tech won a second grant to continue researching how layout can help patients avoid falls. Pilot experiment run, showing members of the Covenant Falls committee and the researcher team members, with a surrogate subject. How a hospital room is designed may keep patients safer and healthier and shorten their hospital stay, a design researcher at Texas Tech University has found. Debajyoti Pati, a professor of environmental design in the College of Human Sciences, recently was awarded a $98,619 grant from the Agency for Healthcare Research & Quality (AHRQ), one of the funding agencies under the U.S. Department of Health and Human Services. "This grant will focus on prioritizing the previously identified physical design interventions so hospitals and long-term care facilities can optimize available capital funds in incorporating physical design solutions to reduce falls," Pati said. 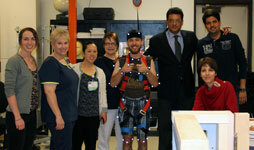 It follows a grant from the National Patient Safety Foundation (NPSF) that allowed him to identify physical design elements that contribute to patient falls. "Based on AHRQ's longstanding commitment to improving patient safety, we know several factors are important to keep patients safe," said Kerm Henriksen, senior adviser for human factors and patient safety at AHRQ. "Texas Tech and Dr. Pati's work should further expand our understanding of risks in the physical environment and suggest strategies to address those risks and make care safer." The NPSF study, which Pati conducted in 2015, included collaboration with James Yang, a professor of mechanical engineering; Aimee Cloutier, Yang's research assistant; Shabboo Valipoor, Pati's research assistant; health care design firm HKS Architects in Dallas; and Covenant Health's falls committee. The group first created likely fall scenarios using industry data and experiences from health care providers, then created a space representing a typical hospital room and bathroom. 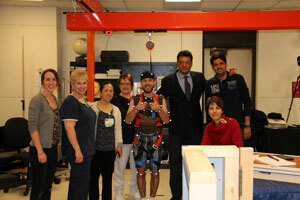 Participants hooked up to motion capture technology interacted with the rooms the same way patients would. They were stopped from falling, but the motion capture technology recorded those movements as they started to fall. They found falls frequently happen as elderly people assumed four types of postures while interacting with their physical environments: pushing, pulling, turning and grabbing. Design elements associated with these postures include bathroom configuration, bathroom door, toilet seat and grab bars, the toilet flush handle, obstructions along the path to the bathroom and IV pole design, among others. "I am proud of the research in which Dr. Pati and his students are engaged," said Sharran Parkinson, chairwoman of the Department of Design. "We are perhaps the only interior and environmental design graduate program in the country that has received a grant from the Department of Health and Human Services." Pati is a professor of environmental design at Texas Tech University. For more than a decade he has studied the association between the physical design of health care settings and safety, efficiency and quality of care.